Most of Australia’s 140 Species of Native Snakes are Poisonous. 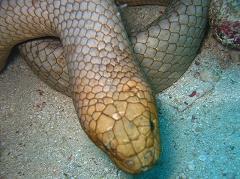 Of the world’s top twenty-five most poisonous snakes, twenty-one of them are in Australia, including sea snakes that are two to ten times more poisonous than cobras. Sea snakes are venomous snakes that have evolved from terrestrial ancestors, and live in marine environments for most or all of their lives. Most have adapted to a fully aquatic life and are unable to even move on land. A hazard of the Australian beach, they compete with sharks, cone shells, ozone-depleted carcinogenic sunshine, and deadly jellyfish to be the first to send tourists to an early grave. Why Missionaries from the Snake Handler Cult Never Return from Australia.